World's Top Spiciest Ramen - emart Habanero Ramen Fire Noodle Challenge! Looks like I did not burn just once (#YOBO). Yes, the Evilbean sets himself on fire again after the Samyang Ramen episode, and this time, I exploded after eating the Habanero Ramen (More videos of myself dying on my Instagram @Evilbean). 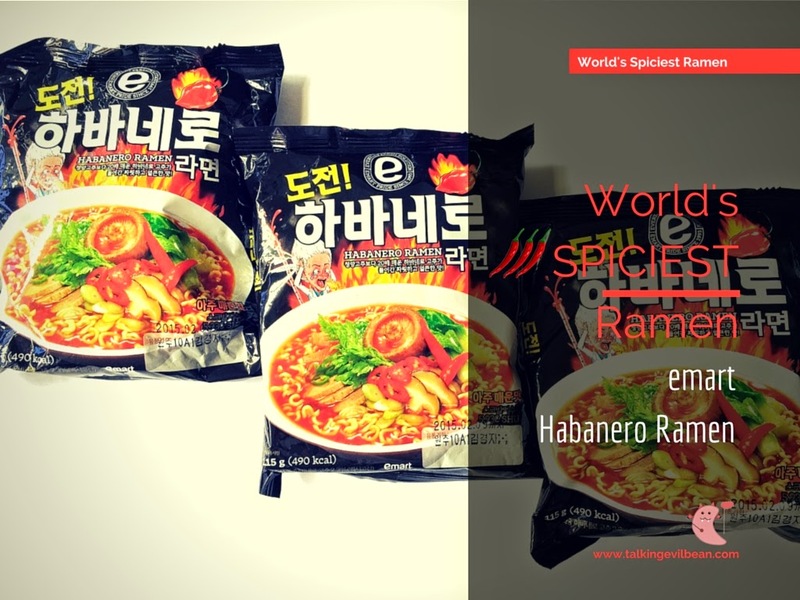 On the RamenEater.com, the emart Habanero Ramen tops the list for 3 consecutive years as the Spiciest Ramen of all times. Being extremely interested and having a death wish, I ordered this ramen from ebay as I have not seen this selling in Singapore yet. What you see at the back of the packaging is the Heat Level, or the Scoville Heat Scale, measured in Scoville Heat Units (SHU). The hottest chilli in the world, which is the Carolina Reaper, averages around 1-2 million SHU, but that is just suiciding using chilli. The tobasco sauce that we spicy lovers love to add in our food averages around 2500-5000 SHU, and to most people, tobasco sauce is already very spicy. Imagine what Habanero Ramen would do to your Eyes, Nose, Lips - measuring at 5.9k SHU on the Heat Scale. If you have read my Samyang Ramen post, you would have known that I was literally on fire after taking in the first bite. And, according to The Ramen Eater, Samyang Ramen is only at 4404 SHU. This Habanero Ramen is 1500 SHU HIGHER! If you look at the front of the packaging closely, it says "도전" in yellow, which means "Challenge! ", and there's a screaming old man with flushed red face and blood squirting out from the left side.. I mean, you can literally be scared just from the packaging. As you can see from the video, the burn for this is different from Samyang. Samyang burns your lips the moment they touch the noodles, but for emart Hananero Ramen, it is more of a slow burning effect. You will feel that as if there is a little man sitting in your stomach and fanning the fire, which spreads the fiery heat all the way up to your lungs and your head. However, the soup broth is sweet and very addictive - you would want to challenge yourself and finish the soup because it gives you a sense of satisfaction. I felt the words "Achievement Unlocked" animating above my head when I finished the Ramen. It's time for you to unlock another achievement in your life. Do you dare to 도전 Habanero Ramen?